Art writer, curator, translator, etc. Nora Al-Badri | Nikolai Nelles, The Other Nefertiti, 2017. Laser engraved glass, metal, 14 x 14 x 22,5 cm. Courtesy Nora Al-Badri | Nikolai Nelles ; Nome, Berlin. While the European press shouts itself hoarse about the French president’s recent declarations to do with his promise to return African art objects to their countries of origin, as if this symbolic gesture might act like a meaningful political withdrawal, one question—among many others—is in fact raised: what constitutes the memory of history? Is it the carefully lit ancient artifact on view in its protective display case that is best able to transmit this memory, or, alternatively, is it an on-site experience in the field? And what if this question were no longer really relevant, both with regard to the wholesale destruction of cultural assets and historic sites perpetrated in recent years by ISIS and to the imminent destruction in the wake of the climatic disorder we are all aware of? 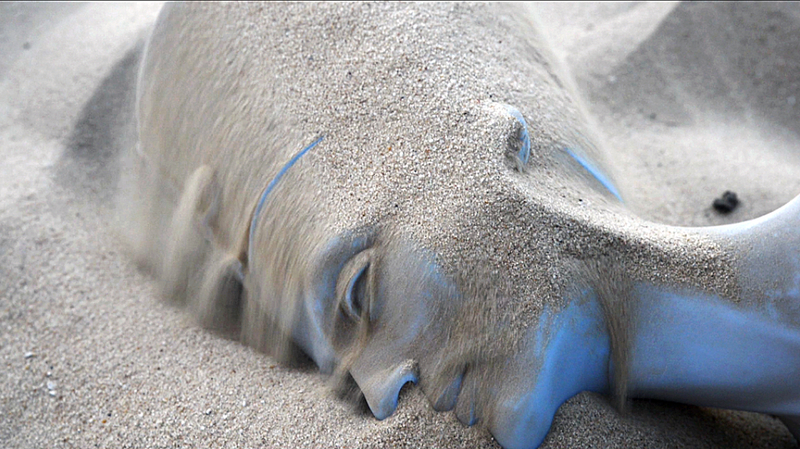 And what if objects became fluid, re-appropriated their own history, and became capable of sharing it with everyone? This last question lies at the heart of the work of Nora Al-Badri and Nikolai Nelles. 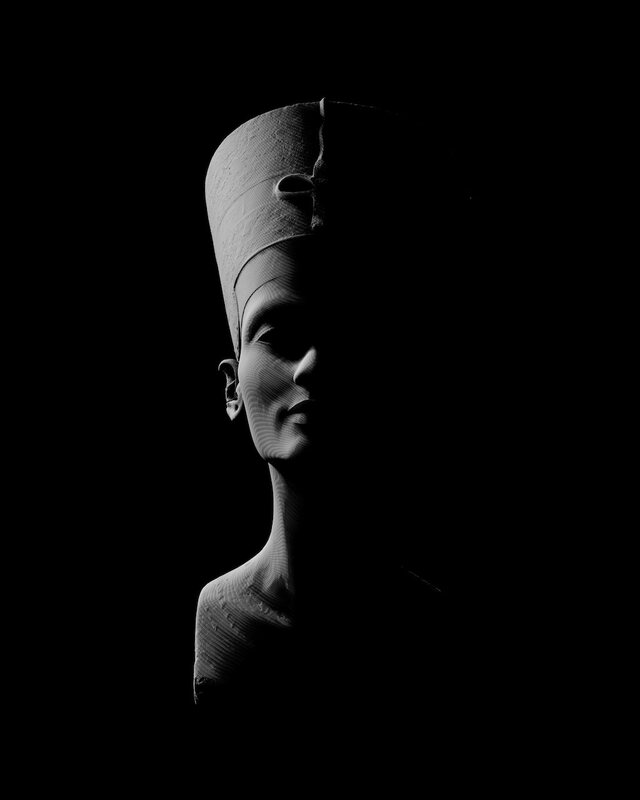 In 2015, when they disclosed the data required for the 3D printing of the bust of Nefertiti held captive in the Neues Museum in Berlin, they opened the way to a whole series of remixes, but also, and above all, to a new way of seeing the work of art based on the yardstick of the common good: accessible to as many people as possible and no longer hidden away behind the thick stone walls of a frozen history. Retrieving data and then sharing it, in order to revisit the monopolies and economies of appropriation and representation, is what they are still doing, this time by getting to grips with another museum symbol in the German capital: the giraffatitan in the Naturkundemuseum. 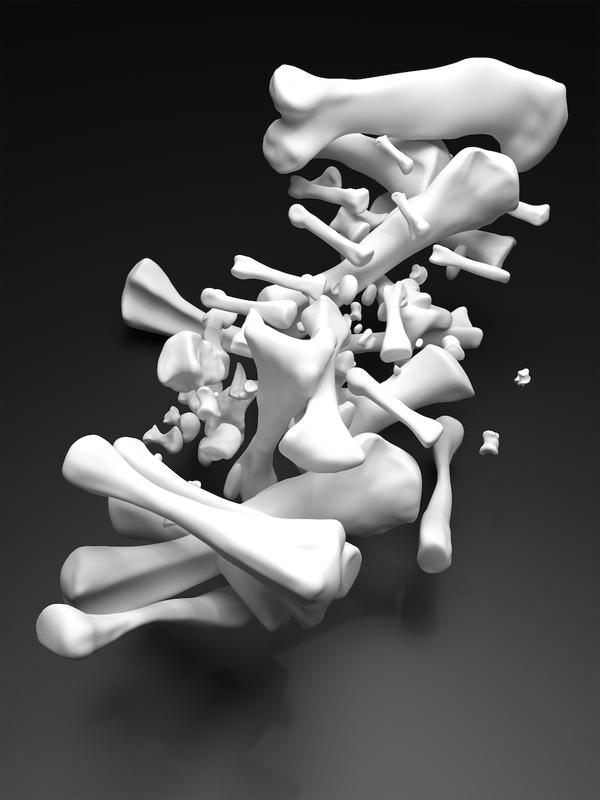 This time it’s a copy of the brachiosaurus’s femur that they are exhibiting in art venues, alongside other bones, fantasized, assumed and drawn by an artificial neural network that they have trained. For the extraction of cultural resources and the resulting black market—representing the world’s third largest illegal trade, coming just after arms and drugs—are leaving whole areas bloodless, no less than the extraction of natural resources and fossil fuels. Re-thinking how we think about the status of objects in the age of the democratization of their three-dimensional technical reproducibility was obviously necessary. 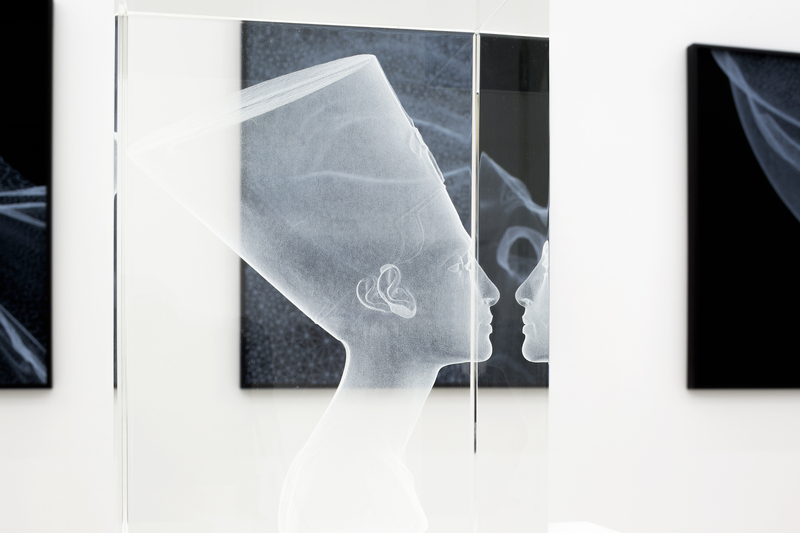 Nora Al-Badri and Nikolai Nelles, The Other Nefertiti, 2015. Video still. Courtesy Nora Al-Badri | Nikolai Nelles. Your latest bodies of works, The Other Nefertiti and Not a Single Bone, challenge the traditional concept of the museum as a closed place for conservation and a safe space for the remnants of extinct civilizations, and attempt to conceive an alternative framework to it that I would summarize as such: the museum as an open data center. Can you expand on your views on this issue? Our main observation is that we prefer to see the museum as a process, as a place of constant negotiation. Yet, the reality in the Global North is rather different: we are dealing with 19th century museums, imperial museums, which are conservative and slow-moving public structures. Those institutions cling to their role as gatekeepers towards cultural objects and their data. It seems that the change of conditions induced by the digital technologies has rather increased an institutional angst of loosing control and relevance. Thus, these institutions are committing a so called copyfraud1, because most of their collections are actually cultural commons and in the public domain. And we truly believe that this institutional angst is unjustified: if they change their mindset, the museums won’t be empty (which seems to be their biggest concern, to be forced to restitute everything). In our practice, we look at technology to try to figure out its emancipatory potential, other canons and the perspective of “the digital” as a social practice and cultural technique. So far, all around the Western world, we see plenty of small scale “digitization experiments” coming and going where museums really don’t risk much. Actually, on the contrary, when we talk about digital repatriation for example (where objects are returned as data), it becomes clear that those actions actually reaffirm the present framework. Because the objects stay put. In addition, just a few of these experiments articulate or deal with the biases of technology, which we regard as crucial. The majority of people and museum experts are not aware that technology is not neutral but socially shaped! Yet, especially when we look at colonial contexts, this needs to be addressed, reflected and articulated. Museums as we know them are dead, they host dead objects for a passive, consuming, entertained audience. This museum practice seems fairly anachronistic to us. But how to invoke change? For Frantz Fanon, struggles for decolonization are first and foremost about self-ownership. They are struggles to repossess, to take back, if necessary by force that which is ours unconditionally and, as such, belongs to us. The museum could potentially be an open data center, but we would prefer a re-centering of the data, following Ngũgĩ Wa Thiong’o 2, which happens automatically if data is open and in the public domain. We would go as far as to imagine possible non-anthropocentric futures as an experience to contribute to a collective imaginary through what we call “data as technoheritage”. Thus, what we try to promote in our practice is the creation of new and meaningful platforms of (re)presentation of the subaltern instead of an echo of the “conventional”—borrowing the term from Ciraj Rassool3—yet vicious museum and to admit that objects in museums are deeply political objects. Nora Al-Badri | Nikolai Nelles, The Other Nefertiti, 2017. Ditone print, 150 x 183 cm. Courtesy Nora Al-Badri | Nikolai Nelles; Nome, Berlin. And what if museums restituted every item to the places where they come from, could the flows of people travelling to see them be substantial enough to modify some geopolitical situations or would it solely reinforce the idea of nation-states which seems to be no longer the paradigm under which it is relevant to think our globalized-post-digital turn world? Isn’t this whole idea of “restitution” here again the fruit of a Western-centric viewpoint, such as exemplifies the anecdote narrated by the historian Adrienne Mayor in one of the interviews that you chose to present in your latest exhibition in Berlin4, when she tells about some Native Americans refusing the repatriation of fossils that was offered to them by a museum as they wouldn’t understand them, not knowing which powers their ancestors imbuded them with? In our pieces, we don’t talk explicitly about restitution because this idea is based on the concept of nation-states, as you mention it, although there is also restitution within countries such as the USA or New Zealand with their indigenous groups. More important than the actual flow of objects (and their data) or of actual people travelling to see the objects is the recognition of ownership and everything that comes with it, such as the decision if objects should be exhibited at all, should be digitized, how they are named and labelled, etc. That is something that should be at the center of this debate, but the power ownership (not location) is exactly what institutions and researchers are not willing to give up because they believe they can take better care (e.g. in terms of preservation and exhibition) of the objects. Thus one could say it is also somehow a symbolic struggle. And this is also where the structural racism begins or continues to exist—a situation that proves colonial continuity. Nora Al-Badri | Nikolai Nelles, Not a Single Bone, 2017. Courtesy Nora Al-Badri | Nikolai Nelles. By disclosing the data of the Nefertiti bust (which, as you often mention, existed for already eight years in the Neues Museum) and calling for its appropriation, as well as by putting a neural network at work on images of dinosaur bones to produce new ones, you bring back to light the fact that history is largely based on speculation, especially for scarcely documented periods, just as much as natural sciences are. So the part of fiction and interpretation which has always been embedded in the discovery and then in the display of historical objects finds here its reflection in the way a neural network processes information to produce its output. This way, you raise this highly metaphysical question: is an object more defined by its data or by the embodiment of it? How an AI imagines a dinosaur comes from our interest in the results of a machine looking at the evolution of a long gone species versus the usual human-centered gaze. The machine produced thousands of possible evolutions, which is in stark contrast to the (human) natural science approach seeking for the “truth” and facts. 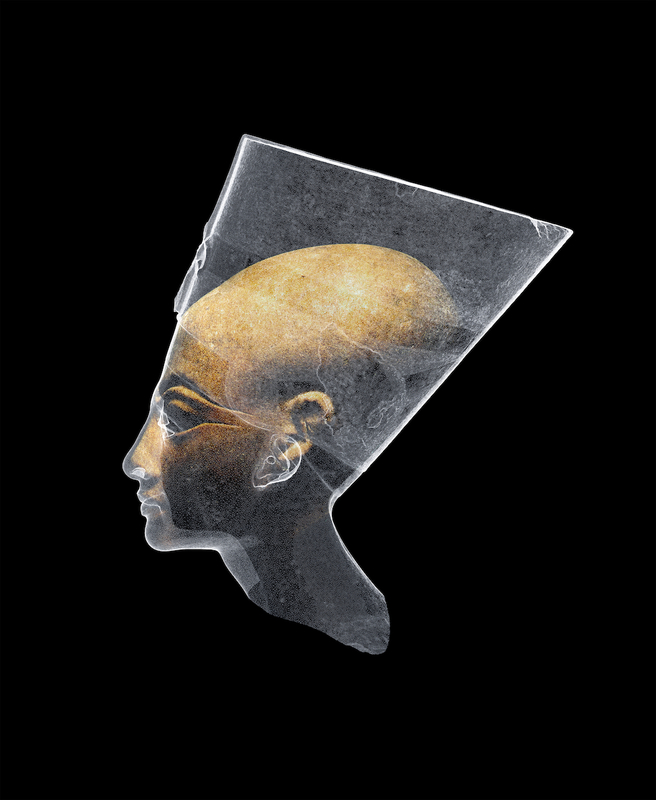 As for the appropriation of the data of Nefertiti, it becomes clear that the data embodies different information than the actual object—you can see more layers, you can explore the object from the inside—and thus changes the perception of the object itself. The relevant aspect in this piece is the emancipatory potential of data, which by being intangible and diasporic itself dissolves the questions of ownership. 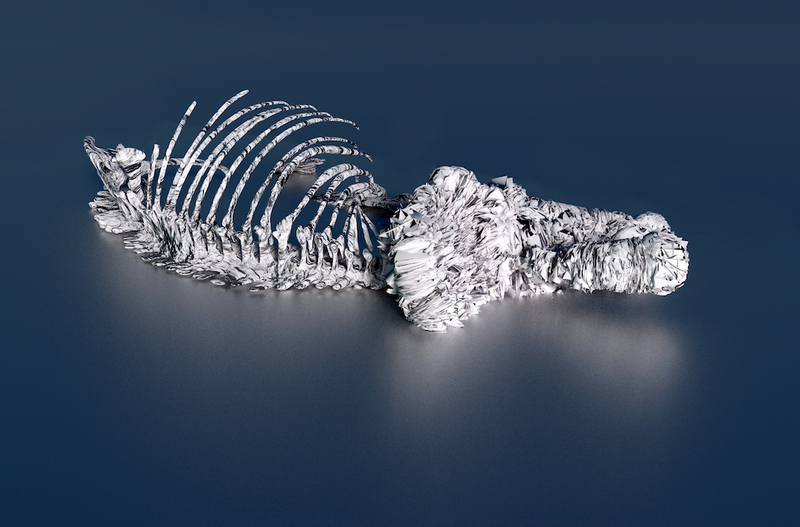 Nora Al-Badri | Nikolai Nelles, How an AI imagines a Dinosaur N°1, 2017. 3D print, various sizes. Courtesy Nora Al-Badri | Nikolai Nelles ; Nome, Berlin. You even look further into the emancipation of objects with your NefertitiBot. Here again, it’s easy to draw a parallel between the criticisms directed at museums and at AI programs regarding the Western biases they generally embed. Can you tell me more about this new iteration of the Nefertiti project? NefertitiBot is a chatbot which seeks to take over the power of interpretational sovereignty from administrative and curatorial museums structures. A bot through which material objects of other cultures in museums of the Global North will start speaking for themselves, shaking off the violent and ugly colonial patina by deconstructing the fiction inherent in institutional narratives and challenging the politics of representation. With the development of the Nefertiti AI and avatar, we aim at asking questions about the state of humanity and at discussing the agency of inanimate things, challenging the human-centric way of seeing the world. When machines will not only be super-intelligent but more human towards the world and all its inhabitants, it will be a transition from a failing human towards a new species. At the very moment this future arrives, their avatars will already be present, their voices will sound familiar to us. The bot will possibly be installed in museums alongside ancient artifacts and collections to push the audience towards critical awareness, raising a voice of the subaltern, making indigenous and alternative stories of the objects visible. It will have a persona and will work as a prototype for museums as a new mediator tool, complementing or replacing the curator and the wall texts. Nora Al-Badri | Nikolai Nelles, Nefertitibot, 2017. Courtesy Nora Al-Badri | Nikolai Nelles. 1 Copyfraud refers to false copyright claims by individuals or institutions with respect to content that is in the public domain. 2 Ngũgĩ Wa Thiong’o, Moving the Centre: the Struggle for Cultural Freedoms, James Currey, 1993. 3 Ciraj Rassool is professor of history and director of the African Programme in Museum and Heritage Studies at the University of the Western Cape. 4 “Not a Single Bone” at Nome, Berlin, September 9 to November 11, 2017.